Abies flinkii, first described in 1989 by K.D. Rushforth (born 1953), is commonly known as Jalisco fir or as Abeto de Jalisco in the Spanish language. 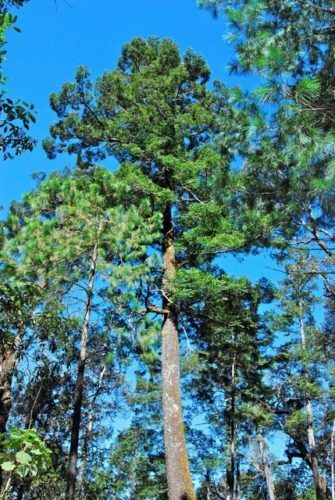 This species was formally listed as a variety of Guatemalan fir (Abies guatemalensis var. jaliscana), but that description was based on study of substandard herbarium samples at Kew Arboretum. Rushforth's description is based on actual field study using freshly-felled timber trees. Description. 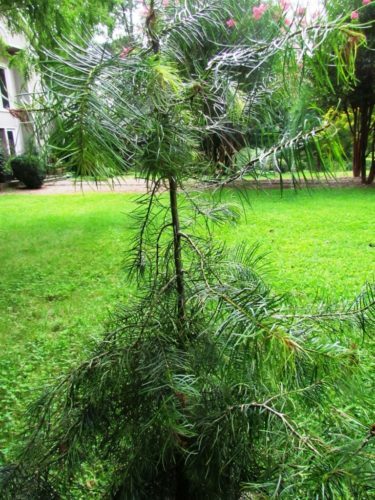 Jalisco fir is an evergreen coniferous species of tree which grows to a mature height of 65 to 110 feet (20 - 35 m) tall with a 3 foot (1 m) diameter trunk at breast height. It's bark is gray, smooth in young trees and on the upper trunk, becoming scaly at the base of older trees. Shoots are slender, green when young, ripening to olive-brown. Branches are spreading and level at the tips. Leaves are spiny below the shoot and widely parted with broad open groove above, 1.5 to 2.8 inches (3.5 - 7 cm) long by 0.08 inch (2 mm) wide. 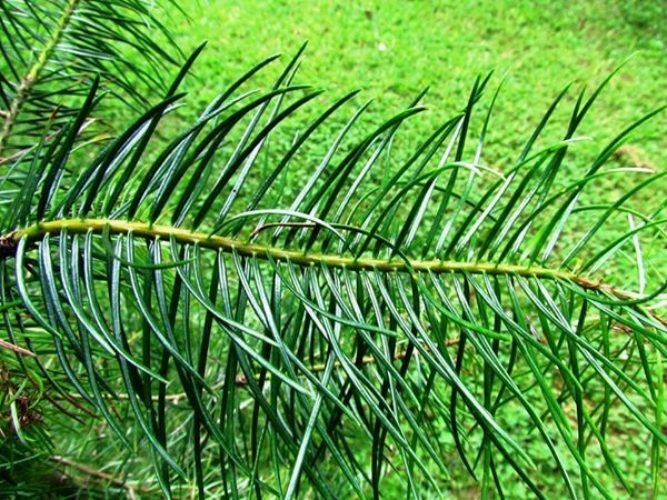 They are among the longest needles in the genus. They are slightly twisted or straight, mid-green above with 2 white stomatal bands below. Seed cones appear on a short stalk (0.6 inch / 1 cm). They are oblong-conical, bluntly pointed at the apex and are 4.8 to 6.5 inches (12 - 16 cm) long by ca. 1.7 inches (4 - 4.5 cm) broad. The light brown seed is ca. 0.3 inch (8 - 9 mm) long by ca. 0.16 inch (4 mm) wide with a 1 by 0.6 inch (2.5 x 1.5 cm) wing. The cones ripen in November. Distribution. This species is native to Mexico — the states of Michoacan, Sinaloa, and Jalisco, where it is frequent on mesic sites between 6,000 and 7,700 feet (1,900 and 2,400 m). Abies flinkii — a closeup of the fabulous long needles at the Cox Arboretum, Canton, Georgia. Abies flinkii — a tree growing in habitat at Cuale, in the Sierra Madre Sur. This is one of the trees that K.D. Rushforth used in his defining study. 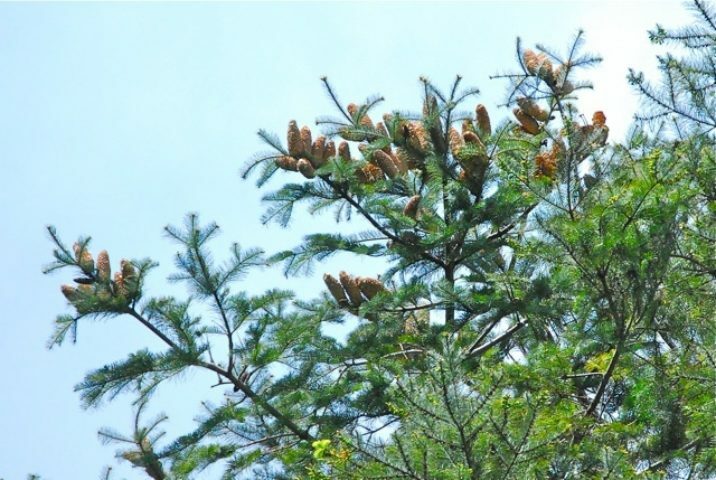 Abies flinkii — a closeup of a treetop with cones growing in habitat at Cuale, in Mil Cumbres, Michoacan. This is one of the trees that K.D. Rushforth used in his defining study. Abies flinckii — a young specimen on the grounds of Cox Arboretum, Canton, Georgia.